On 29 December I promised to tell you a little bit more about TRS80 computers. Well, to begin with, in 1980 there were no such things as a PC, Windows or even MSDOS. At that time there were several types of home computers, most of them with no more than 64KB RAM on board (mind: KB, not MB). So systems like Windows were unthinkable on these machines because there just wasn't enough memory for it. As you may probably know, the heart of any computer is the processor. Many of those old machines worked with either of two processors: the Z80 or the 6502. The Z80 was made by a manufacturer called Zilog and was used in the Spectrum, made by Clive Sinclair, the brilliant British engineer and in many other homecomputers, none of which were so inexpensive as Sinclair's Spectrum. 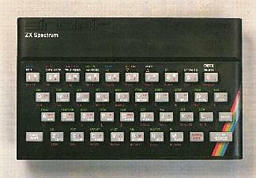 The Spectrum (and its predecessors ZX80 and ZX81) came later than the Apple, which was made as early as 1977. In the same year (1977) the Z80 was used in the heart of another computer, the TRS80, which was made by Tandy, aka Radio Shack . I'm not an engineer, but people who know about the technical side of computers have assured me that the TRS80 was a technical masterpiece. 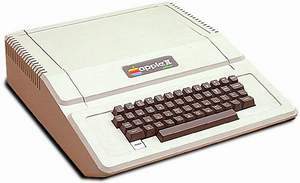 The series was started in 1977 with the computer that would later be dubbed model 1. For saving and loading data many people used a cassette recorder with this computer. If you could spare about 4000 guilders (appr. 2000 dollars), you could buy a floppy disk drive. And a harddisk was so expensive that I can imagine some families must have run into financial trouble because dad insisted on buying a hard drive for his TRS80. It had two built-in (5.25 inch) floppy drives on the right of the monitor, and the keyboard went snugly in a space below the monitor. About ten years ago I bought such a machine second-hand for less than a tenth of what it must have cost when it was new. I must confess I never used it for serious work. But I made lots of programs on it for my daughters, such as a program for playing supermarket, another one to play library and of course lots of games. There is one other TRS80 that I must tell you about, the model 100. But I suggest we'll keep that for later.